When Sylvia Mendez and her family moved to a new town in California, she was excited to attend her neighborhood school. But, she was told she had to go to the Mexican school instead. Sylvia didn’t understand why – she was an American citizen who spoke perfect English. This is the story of segregated schools in California and one family’s fight to end it. 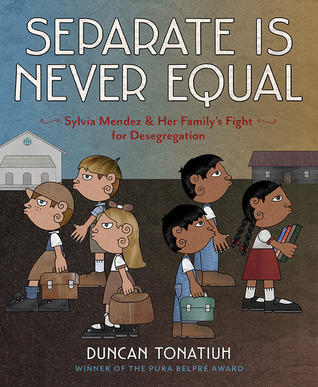 Lesson Idea: Mentor Text: Civil Rights: Read aloud Separate Is Never Equal: Sylvia Mendez and Her Familys Fight for Desegregation as part of a unit on civil rights. Segregation based on race was common throughout the United States in the 1940s and much of what we know about segregation comes from our knowledge of segregation in the southern states. In actuality, The Mendez v. Westminster School District case paved the way for the desegregation of schools in America. The landmark case Brown v. Board of Education desegregated schools in the entire country, seven years after the Mendez victory. A fence separates the black side of town from the white side of town. How does the fence bring two little girls together? Mentor Text: Civil Rights/Character Development: Read aloud The Other Side and discuss how the characters change by the end of the story. In what ways do the characters grow? How does the time period effect change? Discuss the symbolism of the fence. What can the reader infer? Another great picture book biography, this one details key moments in the life of Satchel Paige. Based on historical fact, Rosa and her mother, both slaves, sneak away at night to go to “pit school.” This is where slaves learn to read and write. An interesting piece of American history told in a beautifully illustrated story. Content Connections/Inquiry Study: Read aloud Light in the Darkness: A Story about How Slaves Learned in Secret . Use this book if working on an inquiry unit on slavery or the Civil War. Students could use this as a resource to understand how schooling was not a norm for slaves. Ask how slaves went about learning how to read when they weren’t allowed. Pair this book with Words Set Me Free. Set against key moments of the civil rights movement, Walter Dean Myers eloquently shares the story of the powerful spiritual leader and his belief that nonviolence could be used to overcome racial discrimination. Mentor Text, Biography, Civil Rights, and Writer’s Workshop: Read aloud I’ve Seen the Promised Land: The Life of Dr. Martin Luther King, Jr. and discuss how the author used key moments in the civil rights movement to write the biography. Consider pairing this book with Martin’s Big Words by Doreen Rappaport, in which the author used key quotes from Dr. King as a backdrop to write his biography. Compare the author’s craft in both books and have students choose one type of craft to write a biography.